I do love butter and eggs. I also Love a Parade. Oh yes. 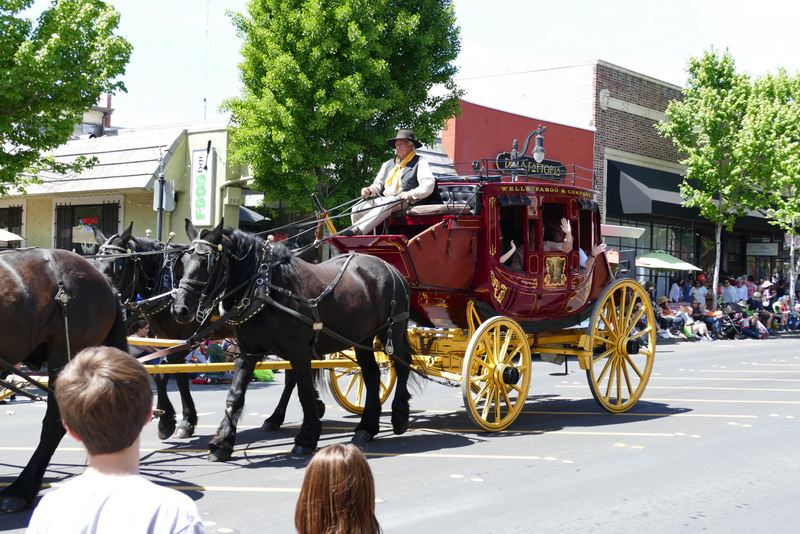 And Petaluma’s Butter and Eggs Days Parade and Festival took me back 65 years to the small city parades of my youth when families drove thirty miles into town for the excitement. And no, we’re not talking about LA’s Rose Bowl Parade or the Mardi Gras parade in New Orleans or the Karneval parade in Köln or San Francisco’s gay parade, all known variously for spectacular floats, huge contingents, exquisite satire, bacchanalian revelry, or all of the above. And hundreds of thousands packing the parade route. Oh no, let’s scale this down to something appropriate for a population of 59,000. Spectacular floats? Well, some effort was put into a good many of ’em, but still. 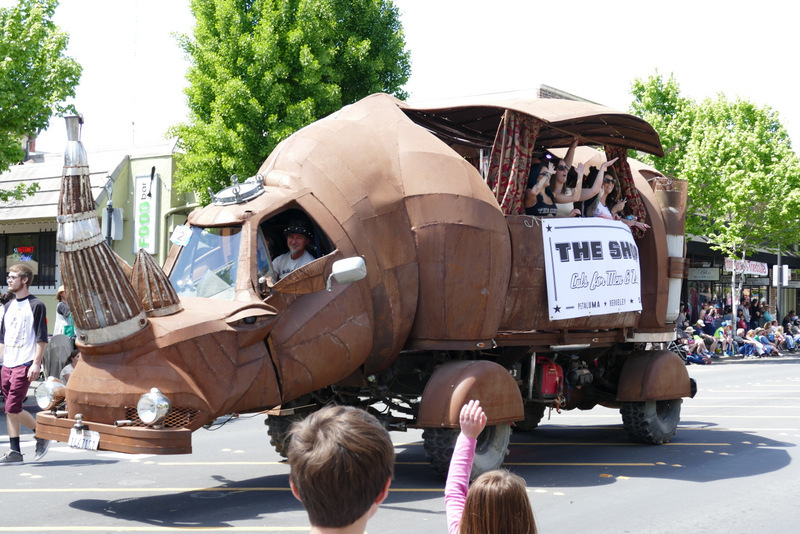 My favorite was this wonderful rhinoceros truck. Marching bands? You bet, four of ’em. But 76 trombones? Oh please, lucky to have seven. Exquisite satire? Ummm, didn’t see none, nor even much humor other than in some chicken-oriented costuming, like this wonderful crossing guard. 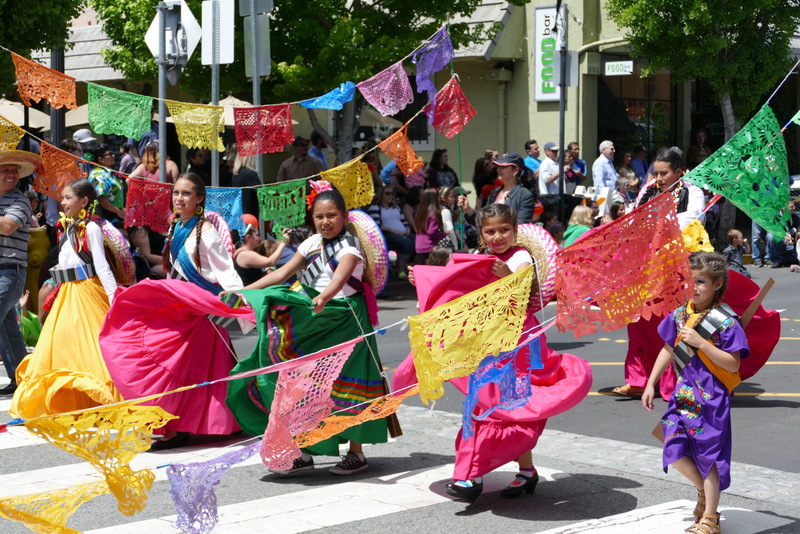 There were lots of contingents of dance schools and clubs, including several Mexican folkloric groups. Hundreds of thousands packing the parade route? 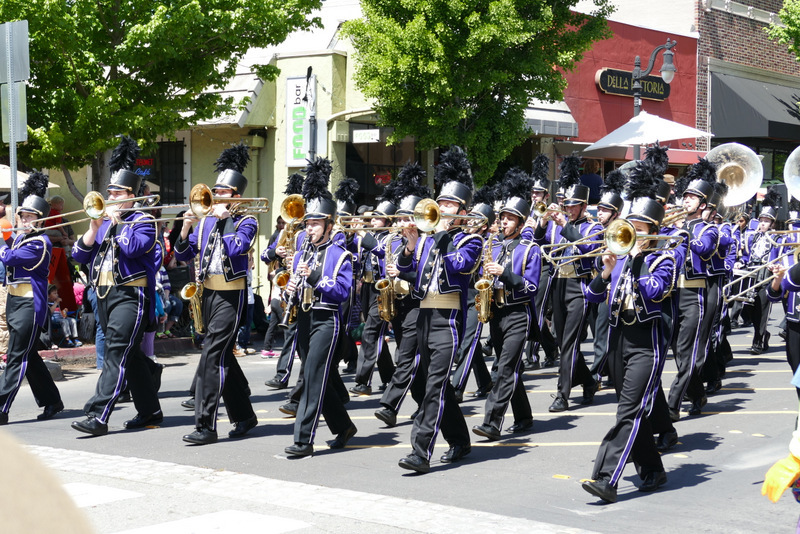 Actually, i thought the turnout was pretty damn fine for a town this size, as the half of the parade route that went down Petaluma Boulevard was solidly lined on both sides of the street and the food and entertainment venues were pretty well thronged. 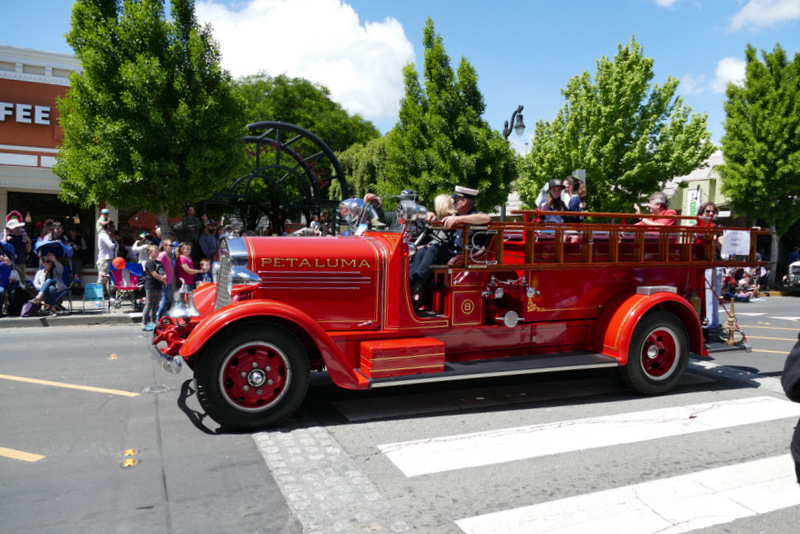 Petaluma seems to be a haven for vintage vehicle aficionados, and there were many old cars and trucks in the parade, including some old fire trucks. OK, that’s the SMART train parked at the Petaluma Station. 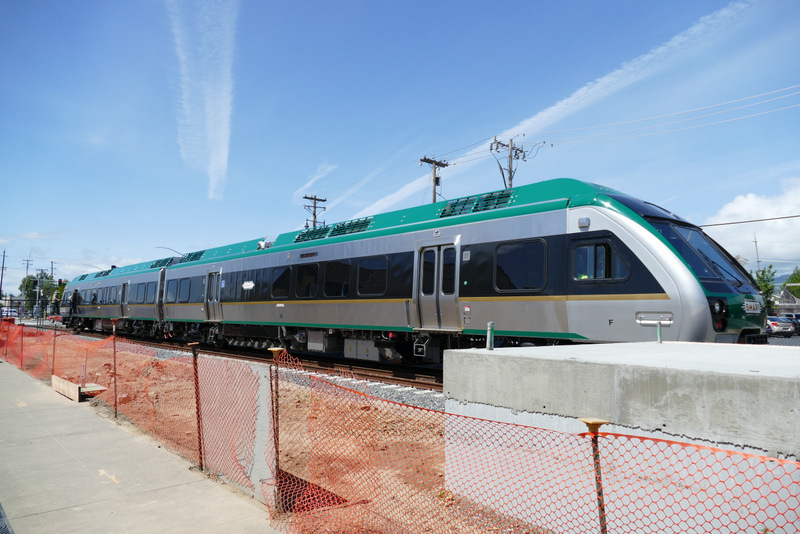 The city is all excited over SMART, folks packed this train while it was parked there, and we’re eagerly awaiting the opening of service from Santa Rosa to San Rafael this fall. 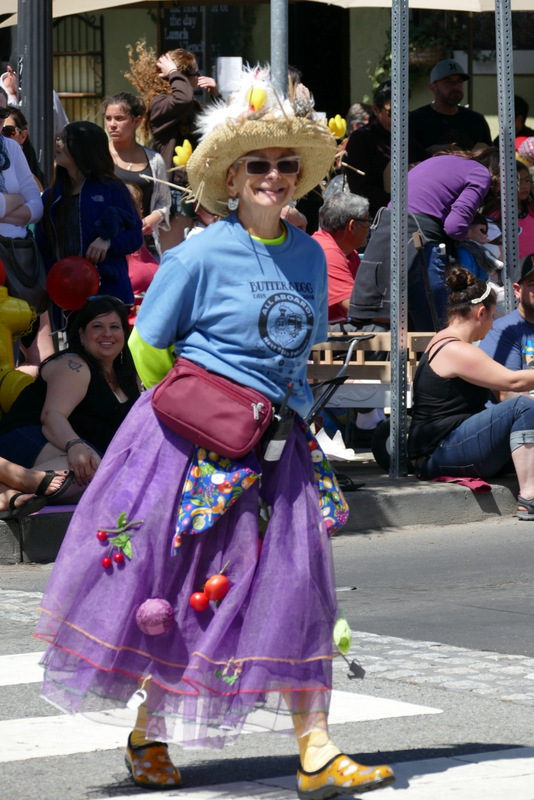 After i’d photographed every parade entry and – forgetting how awful chili dogs always are in a state where you can’t get decent chili – eaten parts of one at a booth, i met Christian for a drink at a sidewalk cafe on Western Ave just off the boulevard. He introduced me to Ace Perry Cider, and it was love at first sip. It was so delicious that i could have drunk several, but fortunately i stood up for a moment as i finished the first and realized that one at 5% alcohol was quite sufficient. I was looking at the bottle with its drawing of a pear and thinking the Ace folks were indulging in a pedestrian pun until i did a bit of Googling and discovered that “perry“! is the original name for an alcoholic beverage made of pears, just as “cider” was the name of the one made of apples and that furthermore “perry” is also the name of the type of pear, now nearly extinct, traditionally used to make the drink. I’ve always made it easy for people to be a Bad Influence on me, so i let Christian trick me into having a Lagunitas IPA with him at Seared and then wove my way home on the Segway. Afterwards, i got to thinking more about the differences i was seeing between this small city parade and the big city ones, and i realized that i was inflating the differences. The only real difference is one of scale. In both, the entries are local businesses, organizations, and politicians. It’s just that those things are all, like the parades, bigger in the big city. Actually, the main difference i saw was what i didn’t see. A good time was had by all rather than bacchanalian revelry and bad behavior. Even though i’m too old for it myself, i still have nothing against revelry, but i sure do appreciate folks in Petaluma behaving better than those in the big cities. For the past three days, i’ve been sitting here watching two new neighbors, a couple of cute little birds (and don’t ask me what they are because i can barely tell a hummingbird from a heron). They’re trying with little success to build a nest on a ledge beneath my patio roof. I’ve never built a nest, but i cannot imagine an easier place to build one, and yet these two are utterly inept. The patio beneath the proposed nest site is covered with bits of would-be nest material that they’ve dropped, but no nest is rising from the ledge. Apparently, for every piece they add, they knock another off. I fear they will not be contributing to their gene pool, and this grieves me since i already find them delightful. Hell, if i knew what they ate, i’d put some out for ’em. I’ve managed to photograph only one of them, the one who sits on the railing and chirps melodiously while the other one does the work. I’m guessing it’s the male and am thinking that if he really wants progeny he’ll give her a hand with that nest since she clearly can’t do it all by herself. Here he is. If you know his name, contact me. I’ve gone Googling around for images of birds with speckled breasts, and the closest i’ve found is Cassin’s Finch, Carpodacus cassinii. But other images of that finch are not even close. 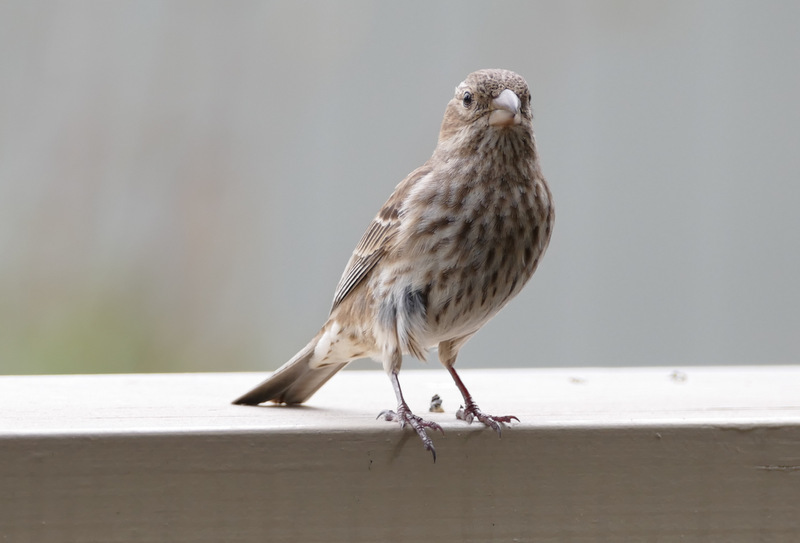 That said, a couple of friends, who by definition know more about birds than i do, say it’s a sparrow. So i dunno, and for all i know, this could be the female. 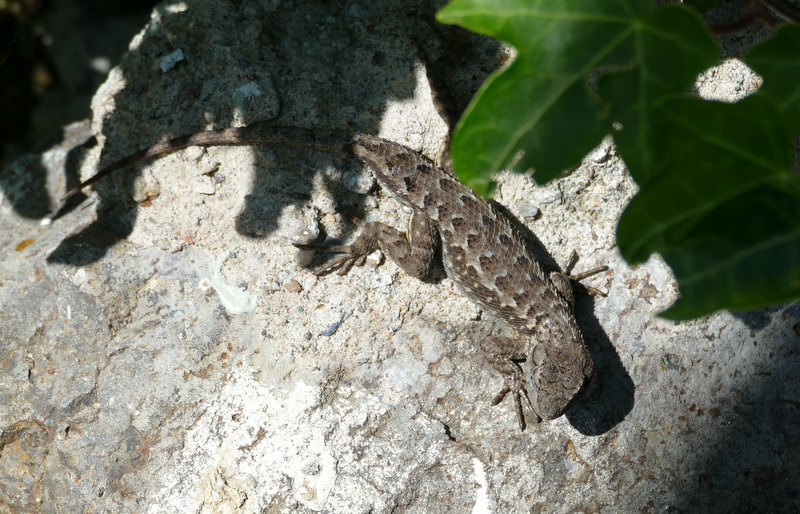 Oh, and since i’m featuring fauna today, here’s a Western Fence Lizard (Sceloporus occidentalis) who was hanging out in Jo Ann’s garden. Considering the passionate intensity of Senator Feinstein’s support of domestic surveillance and her war on public encryption, I think Orwell got it wrong: It’s Big Sister who’s watching you. I didn’t learn about the Great Petaluma Chili Cookoff until all the chef slots were filled, but at least i’m at the top of the waiting list in case there’s a cancellation. I figure if i get in, i’ll win. After all, what could Petalumans possibly know about making good chili? I mean, would you go to Dallas to get a New England Clam Chowder recipe? Being an expatriate Texan, i’ll win hands down. Oh wait, the horrible thought just occurred to me that the judges here might be incapable of appreciating good chili, considering that probably not a single damn one of ’em has ever been to Terlingua. It comes up in about three weeks, and i’m looking forward to attending even if i’m not cooking. Actually, it would likely be a good idea to have attended the thing once before becoming a contestant. The other culinary news is that i’ve discovered a little farm stand off Petaluma Boulevard North that sells really excellent strawberries and have already made a jam of them. Today i dropped by to return their packaging and pick up a box to eat and discovered that they had on the counter some very nice looking sugar snaps, so i bought some of those to pickle. 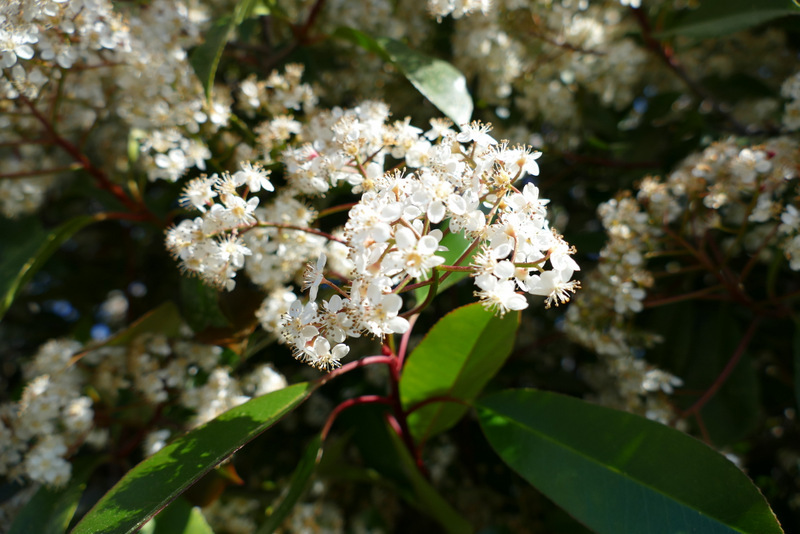 Meanwhile, we’re in a positive frenzy of spring here, and everything’s blooming. 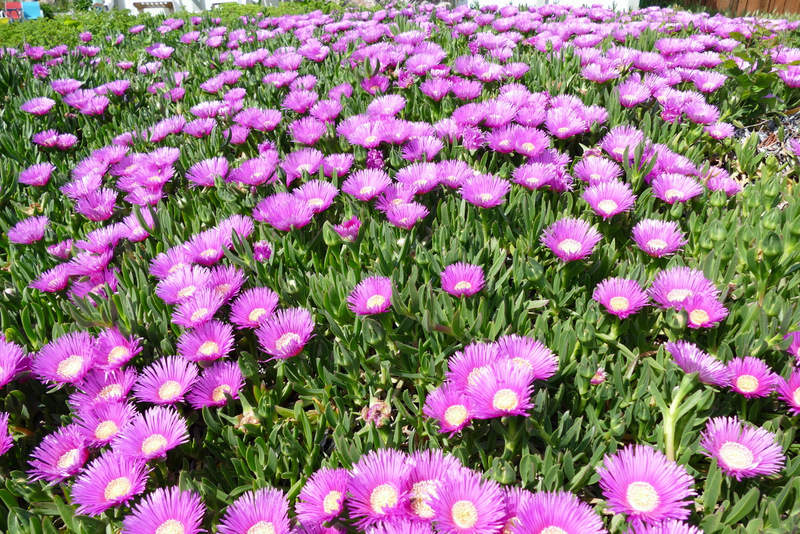 I have no idea what that thing above is, but the next one’s the stuff folks here call “ice plant”, a member of the Aizoaceae family. I’d narrow that down more except that there are 135 genera and about 1900 species in that family. 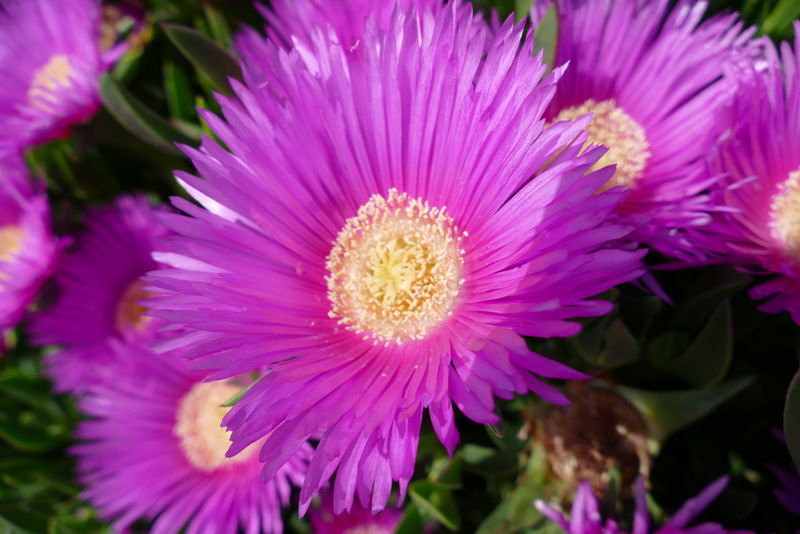 I’m guessing this one may be in the Delosperma genus. Homeland Security is focusing on the lesser danger: 2001 is the only year in history in which more people here were killed by Islamic terrorists than dogs. Oh, my goodness, every time i do a good deed, i get paid back several fold immediately. Here’s yet another instance. Last Sunday i kindly took my friend Christian along to the Marin Farmers’ Market so i could introduce him to the market and to some of my favorite vendors. Well, we both had a good time, me because i got to show him to my vendors and he because he kept running into Francophones he knew, and it was like old home week. Not, of course, that i didn’t also enjoy trying to resurrect my French. So i got a great time out of that. Oh, but it got better. 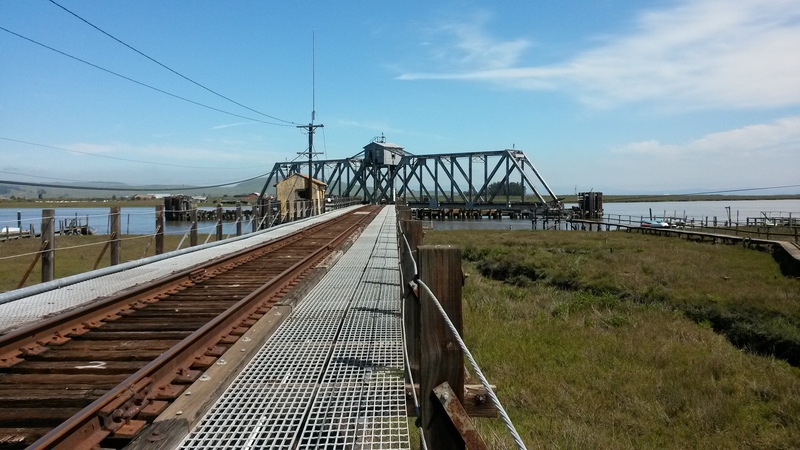 As we were leaving the market Christian wondered whether we might take a detour on the way home and stop by the Northwestern Pacific drawbridge i’d told him about at the mouth of the Petaluma River. Sure, it’s a fascinating bridge, and i’ve written about it on several occasions even though i’ve yet to see it closed. So i cut east on CA 37, pulled off at Black Point on Harbor Dr., turned right on Bay Canyon Rd, crossed the railroad tracks and hooked an immediate left onto little Beattie Ave. Some avenue, the thing is semi paved and only about a hundred yards long until it passes through a cluster of houses and deadends at the railroad tracks. Ignore the Private Road sign because it isn’t. We got out and scrambled up the steps to the tracks, walked down 30 yards to the Keep Out signage at the beginning of the bridge (which is valid since this is the railroad’s bridge), where i left Christian to venture farther while i gimped back to the car. I’d barely got settled when a pickup pulled up behind me and a man got out, climbed up the stairs, and disappeared down the tracks toward the bridge. Strange, i thought, since he didn’t seem to have a camera with him and who else would go out there? I pondered this for a couple of minutes, got out of the car, and immediately noticed that the pickup was equipped fore and aft with those adapters that would let it ride on railroad tracks. Omigod, he works for NWP and he’s either going to perform some barehanded maintenance, or he’s the bridge tender. I scrambled up the steps to discover Christian approaching. Yep, it was the bridge tender and the train is coming. My feathers drooped as it swept me that this sure was a fine day not to have brought a single camera with me. Luckily, Christian has one of those smart phones with a camera in it, so he was able to take a video as we sat there beside the tracks marveling as the bridge slowly swung closed and then the train rumbled past and over the river. Here’s a still shot he took as the bridge was beginning to close. And here’s the excellent video he made. Do click on that link and turn on the audio, as his narrative adds to the experience of watching the bridge and the train. Yes, you do have to sign up for Dropbox to see it, but they don’t ask for a bunch of personal info on you. If this post whets your appetite for bridges, you might want to click around in my Bridges menu. Most particularly in The Bridges of the Petaluma to see more photos of this drawbridge. Me, i’m for Bernie. Hillary would be just slightly less of the same. I’ve been living in Petaluma since mid-September and have found it a warm and friendly town. That said, i had not actually made a friend here until a couple of weeks ago when my nice upstairs neighbor called to the attention of a fellow occupant of this complex that i rode a Segway. That man was Christian St. Claire, born in Belgium but living in this country much of his adult life, a mechanical genius and a fascinating man who, among other interests is keen on electric vehicles. He owns electric mopeds, skateboards, hoverboards, and unicycles. Not to mention several Segways. Yep, there are two of us in Petaluma. He’s the one who wears a cowboy hat instead of a helmet, and i’m already on his case about that. So we’ve hit it off, and he’s proving to be an inexhaustible source of information about Petaluma. For example, the other day he took me into Skippy’s Egg Store, 951 Transport Way, off N. McDowell. Despite the name, it does not limit itself to eggs although it does specialize in them. Unfortunately for Skippy, i have recently discovered that a vendor at the Petaluma Farmers’ Market sells duck eggs, which i love even more than chicken eggs, so i’m no longer in the market for chicken eggs. Skippy’s is a small market with a limited selection, but what draws me is Costcovian prices for dairy products, including Strauss milk and cream in returnable glass bottles as well as Clover milk. Christian has introduced me to his teenage son, who lives with him, and his friend Jo Ann, who doesn’t. Actually, he’s socially voracious, seems to know half the population here, and enjoys taking me in places he knows and introducing me to everyone. Great fun. And through a process of osmosis, chunks of my French are returning. 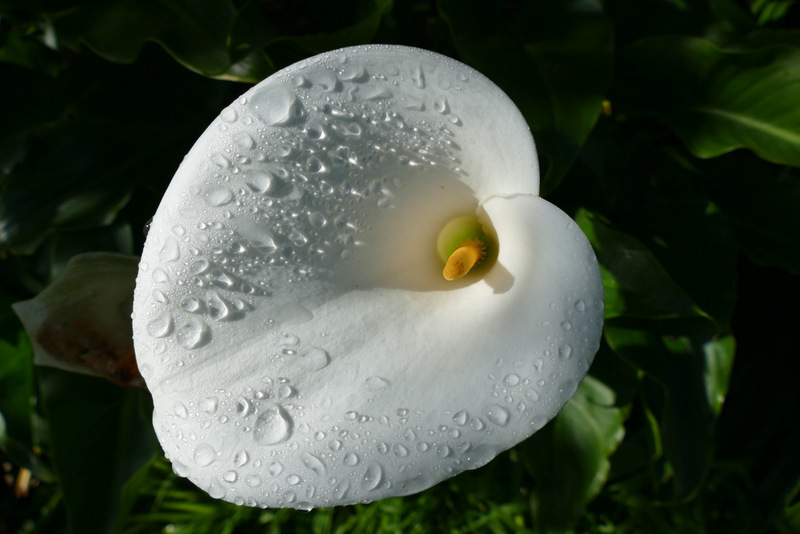 Here’s a Calla lily (Zantedeschia aethiopica) at Jo Ann’s place. She’s a gifted gardener and has an astonishing variety of flowering plants as well as a good range of edibles. The more i see of her, the more i enjoy her. Christian has also taken me to the truck farm of a friend of his, Mikel, a man from whom i’d already bought produce at the Petaluma Farmers’ Market. Small world. I’ve been after him to bring me in some fresh green garlic, and now that i’ve seen him growing it with mine own eyes, he’s committed to bring some for me next Tuesday. He and Christian are planning to buy a couple of kids at the auction next week to barbecue since it’s the season and the males are cheap. I mentioned that i’d love to get involved with this because i’d never dressed a mammal larger than a rabbit. Christian intuited my hidden agenda and casually mentioned that he’d already laid claim to the brains. Aaargh, foiled again, but at least we got to trade brain recipes. Watch for headlines about the breakout of the world’s first cases of Mad Goat Disease, centered on Petaluma, California, and luckily so far confined to only two victims. 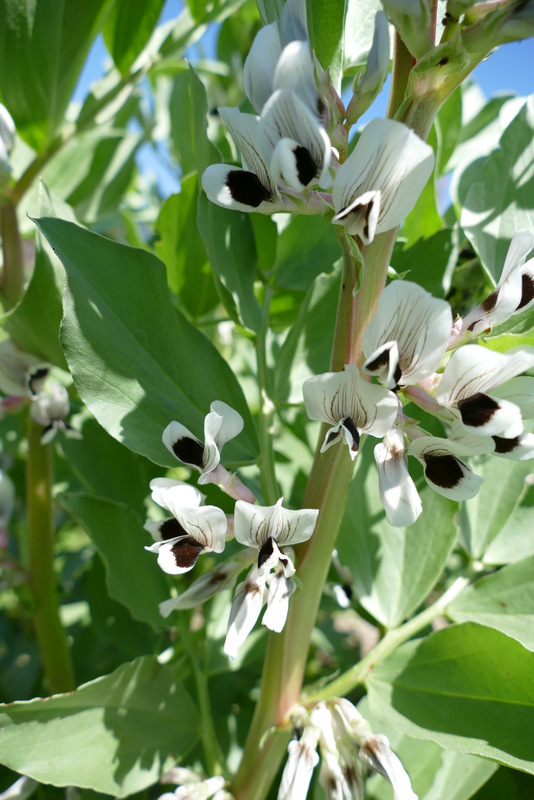 Meanwhile, here’s some fava beans (Vicia faba) in the truck garden.